Art of face injections is tailored by years of experience. 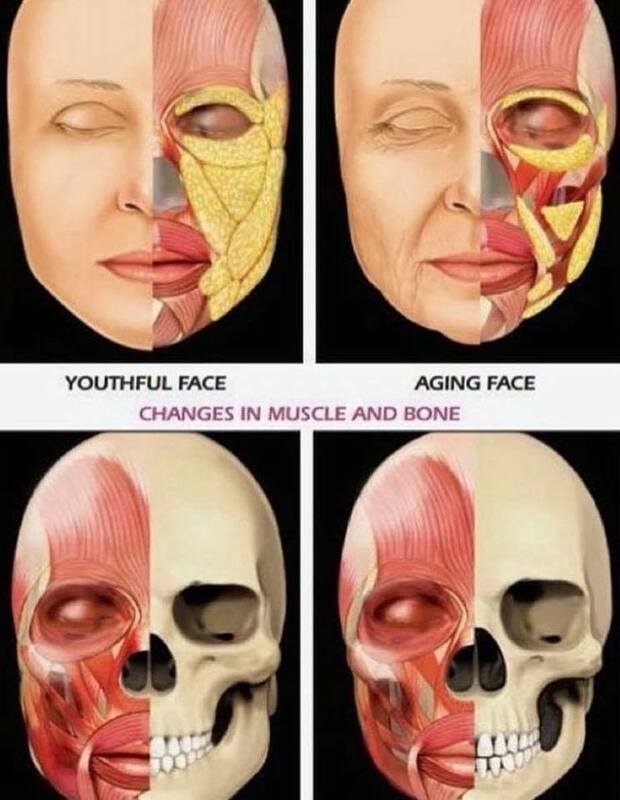 Muscles of face are working in coordination with each other, moving fat pads into certain directions, and muscles are overlapping each other. Therefore it is important to choose experienced expert in injections with excellent knowledge of anatomy, comprehensive training and skills to manage injections complications. It is central of face and therefore treatment of such wrinkles will give nice refreshed and more friendly look. Both females and men find such refreshed and smooth appearance beneficial. Anti-wrinkle injections are popular, lunch time procedure with no downtime. Cosmetic injections around eyes are usually well tolerated, mildly painful, quick procedure. 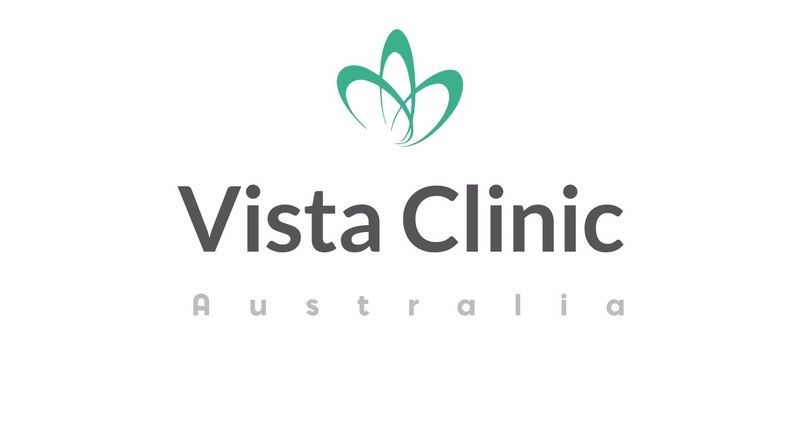 At VISTA Clinic Australia Melbourne cosmetic doctors use very fine needles to minimize pain and bruising. Wrinkles relaxation and eyelid lift effect lasts from 3 to 7 months. More regular cosmetic injections tend to prolong effect of anti-wrinkle injections. Intense sunbath, exercises, sweating, vitamins group B – all contribute into shorter action of muscle relaxant injections. Please, consult with an experienced cosmetic doctor free of charge about costs, types of cosmetic injections and alternative treatments. 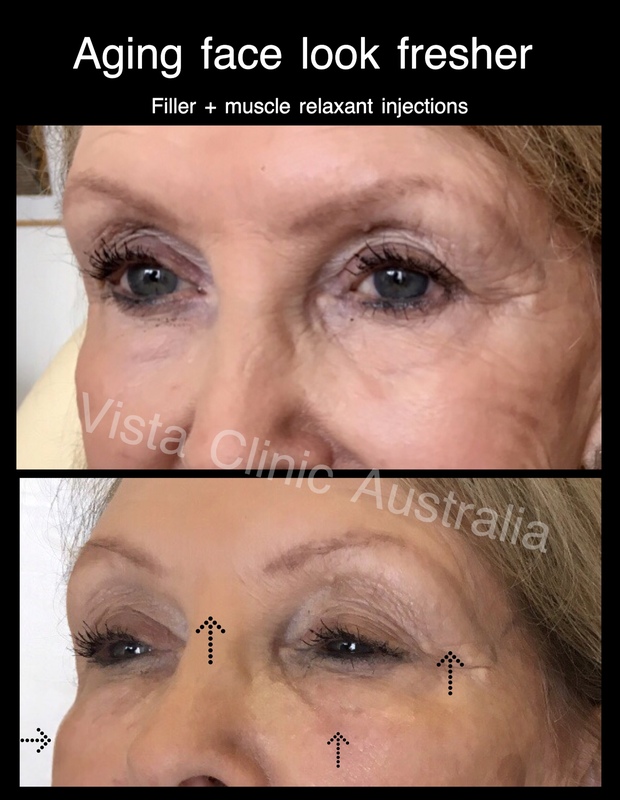 Book your complimentary anti-wrinkle injections appointment with cosmetic physician at Vista Clinic in Melbourne cosmetic center today. Filler cosmetic injections around eye area are common for rejuvenation of lost with age volumes. Dermal fillers are based on a natural moisturising ingredient, hyaluronic acid, which all our body tissues contain and which we loose as we age. Hyaluronic acid is stabilized by a special cross-linking process of it’s molecules to ensure that filler lasts longer. Around eye area, hyaluronic acid fillers are used to fill in eye wrinkles, lift up eyebrows, provide support for drooping lower eyelids, mask eyebags, fill in upper eyelids hollow areas, tear troughts. Eye filler is a lunchtime procedure, well tolerated, although our cosmetic doctors at the Melbourne cosmetic clinic often use numbing cream for additional pain relief. Tear trough filler effect usually lasts 6-8, up to 12 months. Cosmetic injections around eyes are considered advanced level of filler injections. Most common side effect is bruising (around every 5th patient), which can be masked by concealer make up. 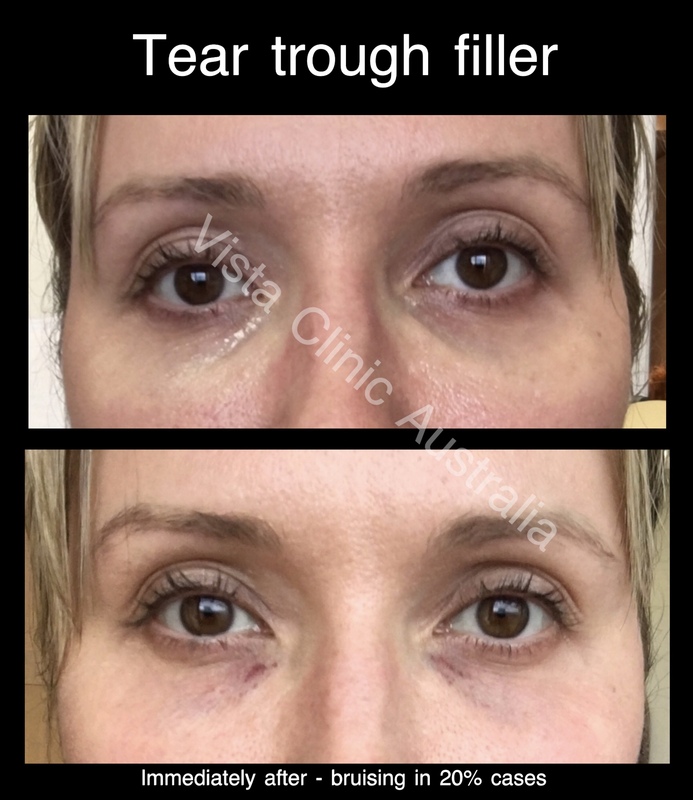 There are possible more serious complications, which VISTA Clinic Australia cosmetic doctor in Melbourne will discus with you during free cosmetic consult ( you can book online or call us). 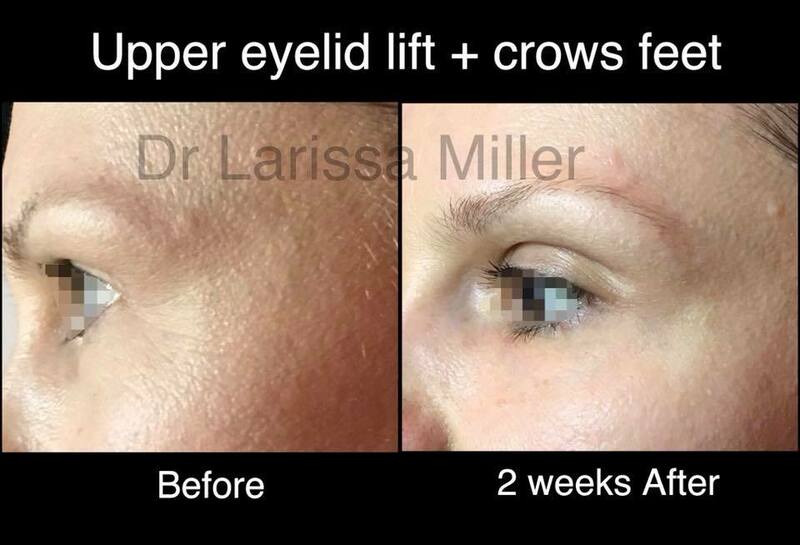 Eyelid skin is thin and getting thinner, less elastic, loose and wrinkles with age. Less ingredients are delivered via micro circulation blood vessels to “build” stronger eyelids skin. Biorevitalisation (or skin booster) is delivery of natural moisturiser in the most organic form on non- crosslinked hyaluronic acid via multiple injections, creating a depo of “bricks”, from which your eyelid skin will be built. Fine cosmetic injections are perceived by your body as trauma and growth factors stimulate regeneration of eyelid skin. The active prescription only medications are injected inside the skin, to the most metabolically active layer. 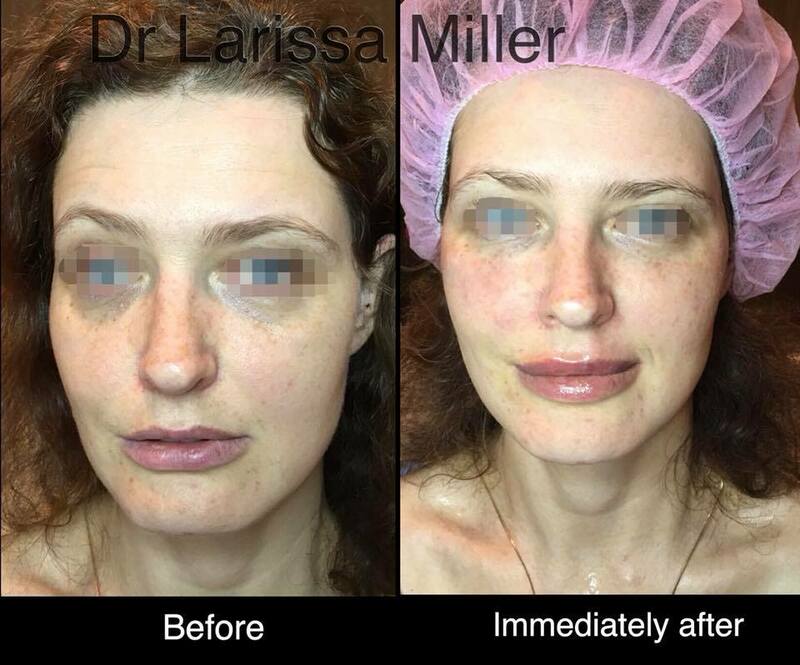 VISTA Clinic Australia cosmetic doctor, Dr Larissa Miller, is a trainer and presenter for biorevitalisation. More info can be seen here. Skin will have glowing, lighter and rejuvenated and uplifting appearance. Similar to what you achieve with make up highlighter of the area. After 3rd procedure – lifting is even more. 3 procedures, lasts 1 year. Dr Miller created own peeling/treatment with whitening, anti-inflammatory, anti-pigmentation, lifting and skin smoothening action. Combination of techniques to achieve nice eyebrow elevation. Combination of techniques to elevate outer hanging part of upper eyelid.